"Live in Gouvy" was recorded in the summer of 2015 at “Ferme de la Madelonne” a historic jazz club in the countryside of Belgium. This record documents the incredible energy at a NYSJE concert. The fans in Gouvy love the NYSJE so therefore Gouvy was a perfect setting to capture the excitement and energy felt by both the band and the audience. This is the first NYSJE record ever with 3 horns on the entire album featuring: Rock Steady Freddie (tenor sax, flute, vocals), Nana Yao Dinizulu (drums), Earl Appleton (keyboards). Alberto Tarín (guitar), Ben Basile (bass), Mark Paquin (trombone, vocals) and Kevin Batchelor (trumpet, vocals). 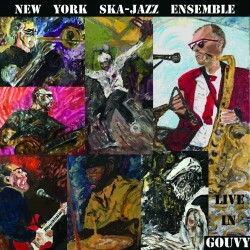 “Live in Gouvy” is also album number 13 for the New York Ska-Jazz Ensemble. Each of the records has been a labor of love by a joint of musicians who are all masters band and this new album helps document their prowess. The bonus track featuring Alberto Tarín’s guitar virtuosity is the only studio track on the album. Rock Steady Freddie invented the NYSJE sound along with the other original members in 1994. Since then the band has performed in 32 countries to this point and has stayed on the road all these years for the love of the Music!!!!! !